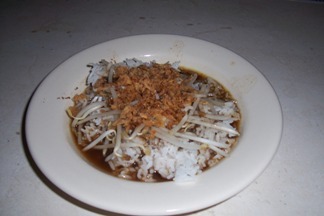 Indonesian Dark Beef Soup or Rawon in Indonesian seem so simple, according to the image. But don’t get me wrong. I have to be honest with you; this Indonesian recipe is one of the most difficult authentic recipes to make. You need the right amount of the ingredients or you can throw away the dish because it tasted awful. The first time I made this soup recipe, I could directly throw it away, because it tasted so bad that you could barely eat. But I didn’t give up, I’ve tried a few more time, and now I can say that I can make this delicious recipe. One thing that you have to remember is that you have to be careful with adding some kluwek, the most important ingredient of this soup recipe. Kluwek can bring terrible taste if you use it too much. I think it’s better to use the juice of the kluwek than the kluwek itself. This beef soup recipe is certainly delicious and love by many people, especially by people from East Java, where this authentic recipe originated came from. My son like it very much despite that he is very difficult with food. If I say to him that we have this dark beef soup for dinner tonight, he said, I love that Mom; I can certainly eat one whole plate. And indeed, he eats everything up. So I practice more and more to get the best results, but one thing I can say, different hands means different taste. So don’t give up if you don’t succeed the first time. Keep trying. Your persistence will win at the end. I can do it, you can do it too. Do you have no time to go to supermarket? looking for a good quality beef without leaving home? Or maybe you can’t find one that meets your needs? Just try heart healthy, delicious grass fed beef from La Cense; Burgers, Steaks, Roasts & Ribs Satisfaction Guaranteed or your money back . So you don’t have to worry about bad product and spare your valuable time.